3. LCD display with easy-to-understand graphics informs. 5. Adjustable brew strength and flavor profile. 8. 12-cup glass carafe is included with the machine for larger servings. If you are a coffee enthusiast who loves to start their day with a steaming cup of delicious coffee, the Breville Youbrew BDC600XL coffee maker is just the thing you need. Likewise, if you are a coffee novice who does not know a thing about how to make coffee in a coffee maker, the Breville Youbrew will solve all of your problems. Its design and performance is suitable to everyday use. This easy to use drip coffee maker makes smooth coffee. One of the best things about this machine is that it produces BPA-free coffee. This way you can rest assured that what you have in your mug is a beverage which is uncontaminated and healthy. The Breville Youbrew coffee maker comes with an inbuilt grinder and a bean hopper. You can use the grinder to produce freshly ground coffee beans or you can simply switch it off and feed your favourite coffee powder into this drip coffee maker. The carafe has been facilitated with brew pause feature which allows you to pour yourself a mug of coffee without having to wait for the whole cycle to finish. And with its 7 strength settings and 5 flavour settings, you can make your coffee taste just the way you like. This sleek design of Breville Youbrew will entice you — it is one of the chicest coffee makers available in the market right now. Its tall and sturdy frame is made of brushed metal which gives it durability and strength. Hard plastic has been scantily used to create plastic parks, and its silicon gaskets give this coffee machine a rich and contemporary look. The front part of the Breville BDC600XL Youbrew drip coffee maker is fixed with an LCD screen and backlit blue LED buttons that allow you to feed instructions into the machine. The water reservoir of this coffee machine has been facilitated with a sturdy lid that opens easily with even a faint push. It also closes firmly to keep the water from spilling. Unlike most other coffee machines, the water reservoir has a big opening which allows you to pour water without spilling it. With this machine, you can make as many as 12 cups of coffee with the push of a single button. The best part is you won’t have to worry about proportions — the Breville BDC600XL Youbrew drip coffee maker mixes ingredients on its own to produce an amazing cup of coffee. The coffee grinder does it job excellently and produces coffee that isn’t either too bitter or too light — you will get the flavour of coffee in just the right amounts. Not just that, this coffee maker is equipped with an efficient carafe that keeps the coffee warm for a very long time, even more than 12 hours. To be able to get a fresh mug of coffee, it is important that the coffee maker be cleaned from time to time. Cleanng the Breville BDC600XL Youbrew drip coffee maker will involve cleaning its three different units: drip tray, brew unit and a wheel that prevents dampening of coffee beans. Cleaning this coffee maker is easy because two of its parts — the brew unit and the dip tray — can be removed from the machine during cleaning. However, you may benefit from the use of a long brush that reaches every corner of the machine. The Youbrew comes equipped with a small brush that can be used to clean smaller parts. You will find this brush in a receptacle underneath the bean hopper. This coffee maker has been made from tough and sturdy materials that grant it life-long durability. As far as strength and longevity goes, this product will not disappoint you. 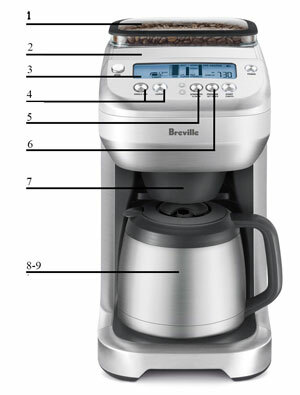 The Breville BDC600XL Youbrew drip coffee maker is slightly more expensive than most other coffee makers. However, it is worth its price because not only does it produce great coffee, it will also stay with you for a very long time. You will have to shell about $300 to get this beautiful machine inside your kitchen. This product is good for coffee lovers because it produces a good mug of coffee every single time. It is also very good for coffee beginners who do not know how to make coffee at home. With this machine, all they need to do is put coffee beans and pour water and the rest will be taken care of automatically. The Breville Youbrew is one of the best coffee machines available in the market right now. Hope this review helped in clearing all your doubts about this coffee maker.